High gloss kitchens are a popular modern option. At Designer Kitchens we only use high quality gloss to allow a natural shine on the material, with no ‘orange-peel’ effect. Designer Kitchens offer a variety of High Gloss Kitchens. 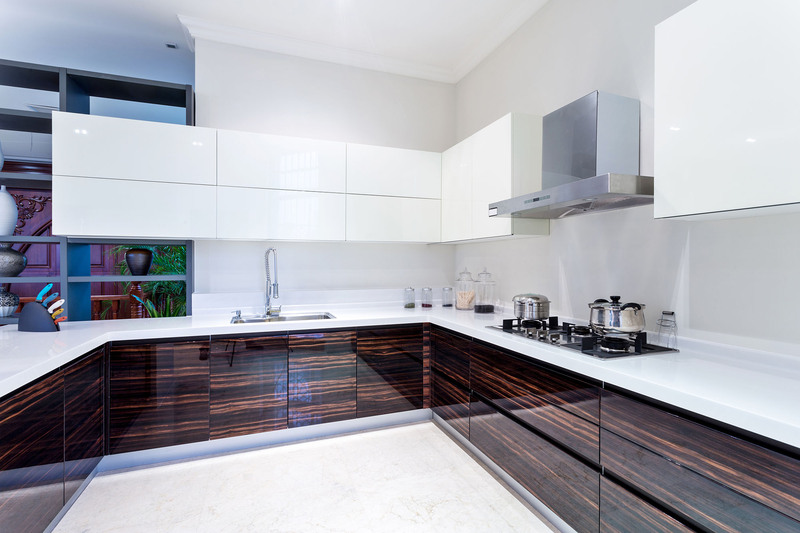 We offer Acrylic, Glass and Lacquer, High Gloss Kitchens. High Gloss Glass is a stunning material. Its luxurious shine makes your kitchen look rich in light. This stunning shine collaborates beautifully with contemporary quartz worktops, to give you a high end, modernised kitchen. The manufactured glass is toughened, to produce optimal strength for your kitchen. High Gloss Acrylic kitchens doors can come in two forms. Either solid acrylic, or acrylic faced (a thin layer of acrylic, bonded onto an MDF base). With a perfectly smooth, highly reflective, mirror like finish, gloss acrylic doors imitate glass for a fraction of the cost. High Gloss Glass kitchens doors are manufactured from toughened safety glass, the doors consist of 4mm thick glass fixed to a 16mm lacquered kitchen door. Glass kitchens are also practical, easy to clean, and extremely durable. The glass is resistant to the pressure typically exerted through accidental knocks or blows that may be expected within a family home. High Gloss Lacquer kitchens are produced by repetitively spraying doors and units with a high quality coloured lacquer. This substance dries out by solvent vaporization to make an exceptionally durable and hard wearing finish, but because it is very thin, the lacquer need be applied in a number of thin coats. High Gloss Laminate kitchens designs are produced by vacuum, forming a semi-melted foil above a pre-created substrate. It is then fixed and pressed together so that the foil is continuous on all the external surfaces of the kitchen door.